A cluster, a grouping, a whole that is greater than the sum of its parts. The GrapeCity concept, loosely translated from its Japanese beginnings, invokes a sense of togetherness. One person alone can only accomplish so much, but together a group of talented and focused people with a myriad of talents and specialties can accomplish the impossible. GrapeCity is a result of many talented minds coming together to teach. GrapeCity was founded in Sendai, Japan in the early 1950's by a group of American educators in Japan. With a focus on high-quality English education, this small group established world-class elementary schools in northern Japan. After nurturing the schools to success, there was a realization that the company had software needs not met by what was on the market. So, GrapeCity expanded into technology and software to create what was needed. Across all our software products and services, our focus is on helping our customers achieve their goals. Our key principles – thoroughly understanding our customers' business objectives, maintaining a strong emphasis on quality, and adhering to the highest ethical standards – serve as the foundation for everything we do. 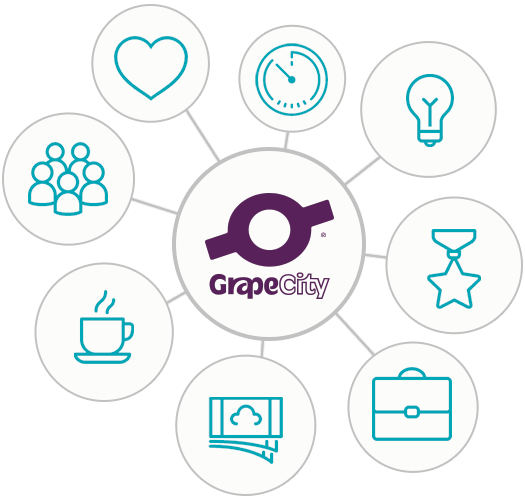 GrapeCity has grown over the years, both organically and by acquisition, to provide high-quality software solutions in a variety of markets, globally. The early 2000s saw intense growth for GrapeCity with the acquisition of three companies: DataDynamics in 2008 (ActiveReports), FarPoint in 2009 (Spread), and ComponentOne in 2012 (ComponentOne Studio, Wijmo, and Xamarin Edition). GrapeCity has its roots in a company named Bunka Orient Corporation, founded by Paul Broman, an American emigrant who played a founding role in establishing English language schools in Japan. When personal computers grew in popularity during the 1980s, Broman began developing educational software to streamline operation of the schools. Since no tools were available to suit the needs of the Japanese market, the company partnered with third-party software vendors to create its own solutions, and eventually acquired three U.S.-based partners. GrapeCity has received numerous industry and user accolades including awards from SD Times, The Code Project, Penton Media Group, DevProConnections, Visual Studio Magazine, Society for Technical Communication, and SQL Server Magazine. What do you get when you mix high technology with creativity, flexibility, and a relaxed vibe? No, not an online yoga class (although good guess). You get GrapeCity, of course! We pride ourselves on our world-class developers, cutting-edge products, and top-notch customer service – none of which would be possible without the curated care of our company culture. We work hard but also value families and a work-life balance. We collaborate, hash things out, build one another up, and tear down walls. Ideas and concepts are meant to be shared, and sharing only makes us and our products better. Management’s doors, the office spaces, and our minds are always open. We’re located on the border of Shadyside and East Liberty, on the cusp of new technologies with classic Pittsburgh roots. Keep reading to find out how to join us. Our greatest assets are our people, and with over 850 employees worldwide, GrapeCity is dedicated to employee health and happiness. It should give you some indication of GrapeCity’s perks when HR asks you what your favorite snack is, and on your start date you find that snack awaiting you at your desk. Or that one of the first questions asked is if you have any food allergies, because “we feed you here.” But of course, the benefits of working for GrapeCity go way beyond food. Flexible work hours, amazing company-covered benefits, competitive time off, and 401K matching are just part of the generous compensation package. So you've read about our culture and our perks and you want to be part of our team – that's great! Click through to see the openings we currently have at our offices. Don't fit one of these descriptions? Send us your resume, we're always looking for new talent. Email resumes@grapecity.com.